Wednesday, May 24 Tualatin Valley Academy's third and fourth grade classes took students on a trip around the world. 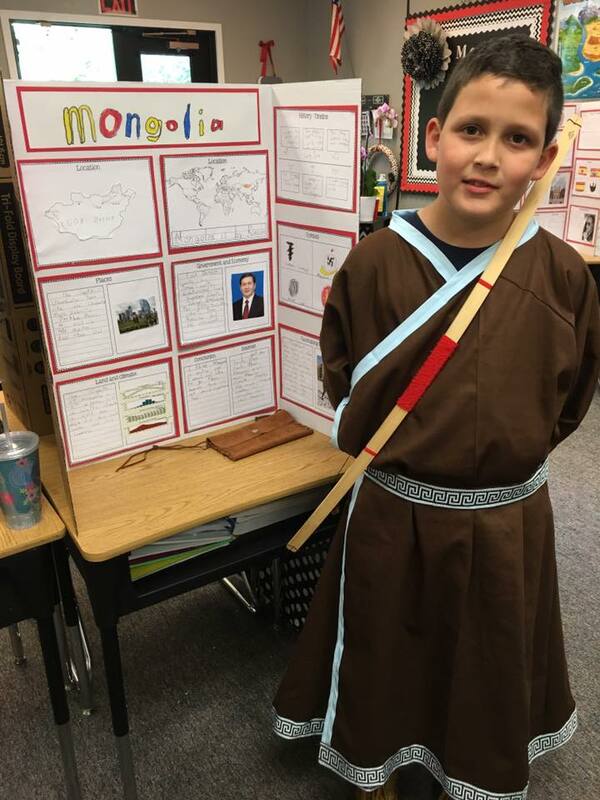 Hands on learning has been proven to be the most effective, so each student researched a country, learning about things like that country's culture, food, clothing, economy, government and places of interest. They then made a presentation board and did an art project to represent their country. The day of the fair they dressed in traditional clothing from that country and brought food for their classmates to try. Students presented their countries to other TVA students, family and friends who toured the fair. Mrs. Youker is excited about STEAM (Science, Technology, Engineering, Art, Math). She attended the EXSEED Conference in Loma Linda, CA last year and brought home a lot of new, exciting ideas she was excited to try out! Always one to be on the cutting edge of education research, one of the first things she did was add stability balls to her classroom instead of chairs. Research has shown that kids need to be able to move while they learn, and she wanted them to be able to have that flexibility as needed. The kids enjoy the ability to move during class, and one parent observed that even though everyone in the classroom seemed to be moving, they were all quietly focused on their work. The other STEAM emphasis Mrs. Youker is doing this year is adding as many science experiments to her curriculum as possible. The class science textbook has many fun experiments to do to complement the materials they are learning. The class has enjoyed looking through dirt, testing the hardness of rocks, and running around the school's track to learn about acceleration, just to name a few. One Friday a month all 3rd grade students get an extra science experiment. When they do this experiment each month, they talk about the Scientific Method and use it to guide their learning. Mrs. Youker's class has had a lot of other fun learning experiences this year too. At Christmas they took part in a play with other 3rd and 4th graders called "Star of Wonder", which showed how Jesus came to this Earth to be born for us. They have also taken exciting field trips to the state capitol and OMSI. The class has learned about their communities and the 3 branches of government. They are learning cursive and handwriting. And, most importantly, they are studying about the Bible and Jesus' life on Earth. Mrs. Youker is working hard to prepare her students well not only for 4th grade, but for college and beyond. She is guiding them through this school year with an eye to each student's future, and her students have benefitted greatly from her guidance.